Design Space Friday is all about slicing a window pane card base. 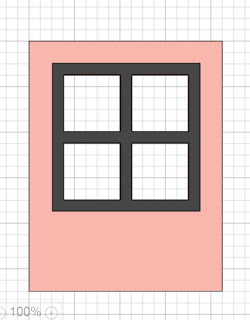 The two templates created today may be used to create a window pane that may be placed atop a card base (the gray piece). And a template for a window pane card front. A card front for this tutorial would be a 4 1/4 x 5 1/2 rectangle with a window pane cut and this piece may be placed atop a card base (8 1/2 x 5 1/2 folded to 4 1/4 x 5 1/2). Can you show us the card you made with this cut?